Foundation of the Journal by Gérard Parizeau, as first Director. The Journal was a monthly publication between 1932 and 1935. Assurances became a quarterly Journal, subtitled : Journal devoted to the theory and practice of insurance in Canada. The Journal was transfered to Sodarcan Inc. by Gérard Parizeau. Monique Boissonneault was the Journal’s Secretary since 1977. Nomination of Rémi Moreau as Editor Secretary. He introduced a new part in the Journal, called Research and Development Bulletin, published between 1980 and 1983. The Journal celebrated its fifthieth anniversary. Gérard Parizeau published an article in the anniversary’s issue titled « Comment est née et a survécu la revue Assurances ». Rémi Moreau became Director of the Journal. He was also acting as Chief Editor. Some changes were made on the 60th anniversary’s issue and subsequent issues such as a new cover page and a reduced format. Lise Jolicoeur was then the Journal’s Secretary. Murielle Laramée succeeded to Mrs Jolicoeur as Secretary at the end of that year. Donation of the Journal to the École des Hautes Études Commerciales by Sodarcan Inc. The Journal was then directed by Georges Dionne, Risk Management Chairholder. Rémi Moreau became Editor-in-chief and Claire Boisvert was the Journal’s Secretary. For its 65th anniversary, important modifications were implemented. Among changes, let us mention new cover, typography, management, and editorial policy. Some members of Journal Committee were changed and an International Editorial Board was created. The Journal created a new evaluated article category. The mission of the Journal was reoriented by adding risk management dimension. Members of the Journal Committee are mainly academics. The Assurances Journal becomes Insurance and Risk Management Journal 2004 Martin Boyer, professor of finance, is named director of the Journal. J. François Outreville, professor of finance, is named director of the Journal. For its 80th anniversary, some changes are made such as a new cover page. 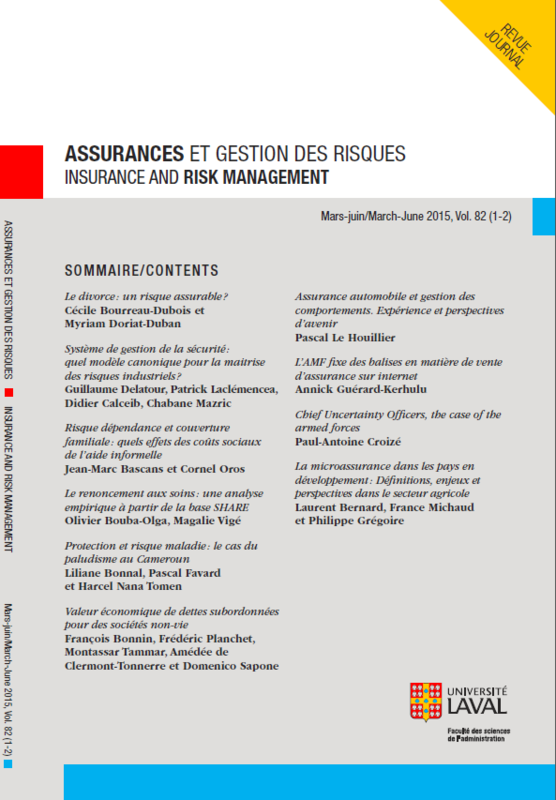 A special edition is published at the end of the year on Insurance history. A new website is created and gives quick acces through the subscription to the paper published during the past ten years. The operations of the journal are transferred to the Faculté des sciences de l’administration de l’Université Laval.